MALE DOMINATE (Means large, thick, tasty spears) Jersey King Asparagus, considered the best Asparagus to grow and eat. 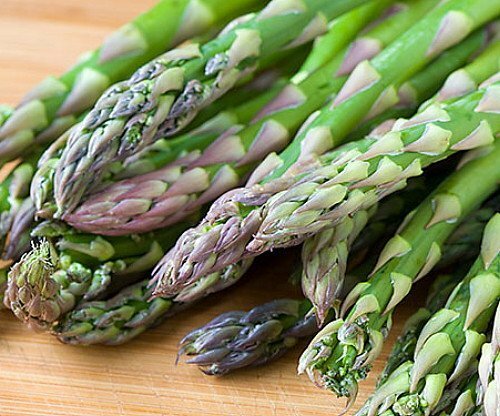 Don't grow inferior Asparagus Varieties. Grown only the Best! All male hybrids do not produce seed, consequently the plants energy is utilized for highly productive crops. Our field trials consistently show that our variety, Jersey Supreme, outperforms the competition with productivity and flavor. Roots received before planting time may be packed in moist soil or sand and stored in a cool place until ready to plant. PLANT roots as early in spring as soil can be worked. Choose a sunny location with rich, well-drained soil. When selecting a site, keep in mind that asparagus is a perennial vegetable; a planting should not be disturbed. Dig trenches 6-8" deep and 12-15" wide. Set roots in bottom of trench, spacing crowns (center) 15-18" apart in the row. Spread roots out as far as possible, and cover with 3-4" of fine soil. Fill trenches in as shoots grow. Space rows 2 1/2 - 4' apart. CULTIVATE OR MULCH to control weeds. Fertilize at least once during growing season, and water well during dry spells. IN LATE FALL, cut tips down to ground level when they have turned brown.Do not cut spears heavily until the third year.